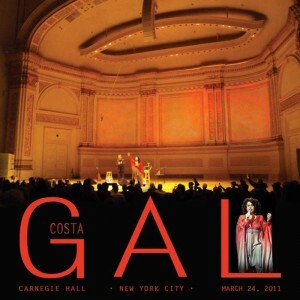 I went to listen to Brazilian singer Gal Costa at Carnegie Hall last night. Just her voice and the sound of Luiz Meira’s guitar. A show full of “bossa nova” songs – and I was expecting more songs from the repertoire of Caetano Veloso, Chico Buarque, etc. … Anyway it was wonderful until the end – after all, is not everyday that we have the luxury of listening to top quality Brazilian music, live, in the US. As she said: ”This is my mission on this planet: to give comfort, to give good feelings with my voice and my music” And that was exactly what she did on the stage of the most wonderful theater in America. When she returned for the encore she sang “Dindi” I didn’t know I liked this song that much until last night, when, in my opinion, she performed the definitive version of it. The sound happening on that stage was like crystal clear water flowing smoothly between the stones in a creek. It was exhilarating! And the waters of this river? Ontem à noite eu fui ouvir Gal Costa cantar no Carnegie Hall, em New York City. Só a voz dela e o som do violão de Luiz Meira. Um show praticamente “bossanovista” – e eu esperava mais músicas do repertório do Caetano, Chico e etc… e até uma pequena banda… De qualquer maneira foi maravilhoso até o final – afinal não é toda hora que a gente, aqui nos usa, pode ter o luxo de ouvir música brasileira da melhor qualidade. Ela disse no programa: ”a minha missão neste planeta é dar prazer e emoção com minha voz e minha música” Foi exatamente isso o que ela fez no palco de maior prestígio deste país. Quando ela voltou para o bis, Gal cantou “Dindí” Eu não sabia que eu gostava tanto desta música até ontem à noite, quando, para mim, ela cantou a versão definitiva. O som que saía daquele palco era como água cristalina fluindo suavemente entre as pedras de um riacho. I am in love with the brilliant book: “Blood, Bones & Butter: The Inadvertent Education of a Reluctant Chef” (Random House) by Gabrielle Hamilton. 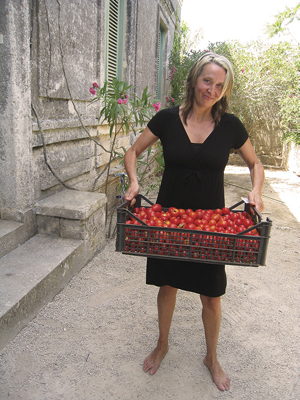 The driving impulse behind her determination to open a restaurant, she explains, was to “harness a hundred pivotal experiences relating to food — including hunger and worry — and translate those experiences into actual plates of food,” to reproduce the sort of hospitality she’d experienced traveling “from Brussels to Burma,” in a 30-seat restaurant in “the as-yet-ungentrified and still heavily graffitied East Village,” to give guests the sort of primal food experience that existed in small towns around the world, long before snooty words like “artisanal,” “organic,” “diver-picked,” “free-range” and “heirloom” became trendy seals of approval in big-city restaurants. Gabrielle is the daughter of Mr Jim Hamilton – I did his portrait, in three versions. She grew up in Lambertville, NJ – where I live now. A vida de uma chefe de cozinha, com cicatrizes e tal. A vontade por trás da sua determinação em abrir um restaurante, ela explica, era de “juntar uma centena de experiências relacionadas com a alimentação – incluindo a fome e a preocupação – e traduzir essas experiências reais em pratos de comida”, reproduzindo assim os mais variados tipos de hospitalidade que Gabrielle experimentou em suas viagens “de Bruxelas à Burma,” resumidos em um restaurante de 30 lugares, no “ainda-intacto bairro novaiorquino -e cheio de grafite- East Village.” Ela gostaria de oferecer aos clientes o tipo de experiência culinária primordial que existe em pequenas cidades ao redor do mundo, muito antes de palavras arrogantes como “orgânico,” “free-range,” “caseiro,” e “artesanal” tornarem-se moda e em selos de aprovação nos restaurantes das cidades grandes. Gabrielle é a filha do Jim Hamilton – eu pintei o retrato dele, em três versões. Gabrielle cresceu em Lambertville, NJ – onde eu moro agora.